On our recent trip to Mexico I tried this wonderfully chunky Guacamole. I had never been a big fan but after trying this low carb, high fibre and heart friendly potassium dip I was hooked! Cut avocado into quarters, remove pit and skin. 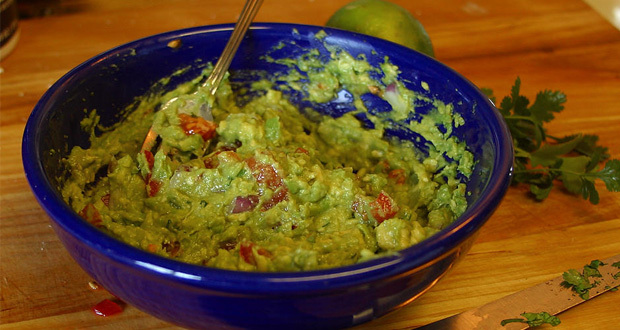 Cut avocado into small cubes then mash coarsely leaving large chunks. DO NOT OVER MASH. Remove skin of the red onion and finely chop. Mix onion into mashed avocado. Cut lime in half remove seeds and squeeze juice over avocado mixture and fold in. Finely chop cilantro and add to mixture. Add Tajin or chilli power if using. Mix ingredients gently together being careful not to over mix. Mixture will appear lumpy. Enjoy immediately and refrigerate left overs in a sealed container.